It's safe to say that over the last several years, light, bright, and white has been the name of the game in design. It's a classic, totally livable trend that will never truly go out of style. Now we are starting to see a shift toward dark and moody spaces, and we are loving it! It still feels classic, but in a fresh and modern way. Here are some of our favorite spaces that incorporate darker hues. In our Vineyard Parade Home office, we went dark with tone-on-tone painted shiplap and cabinetry. Here's a handy guide we made with our favorite black paints and how to use them. This home mixes dark walls, door, and trim for a rich exterior. 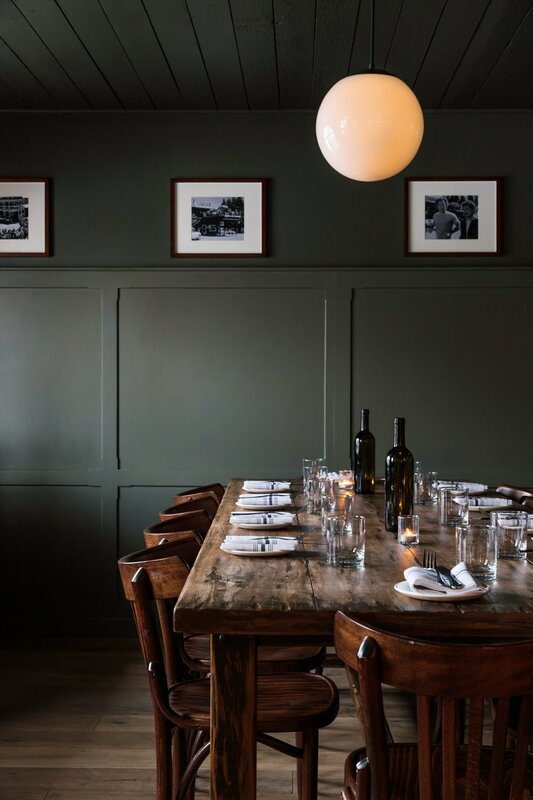 We love that this dark gray-green is used on the paneling, walls, and ceiling. In our Promontory Project master bedroom, we added a dark textured grasscloth behind the bed to give it an upscale yet cozy feel. This entry combines dark painted stair treads with the same tone on wainscoting. Dark floors make the whole scheme complete. Want to go dark on your front door? Here's our favorite dark paints from this post. This pairing of dark painted walls, wainscoting, and a dark bathtub feels both classic and fresh. We predicted that dark green would be one of our favorite trends for the new year, and we were not wrong! Our favorite green paints? Find those here!